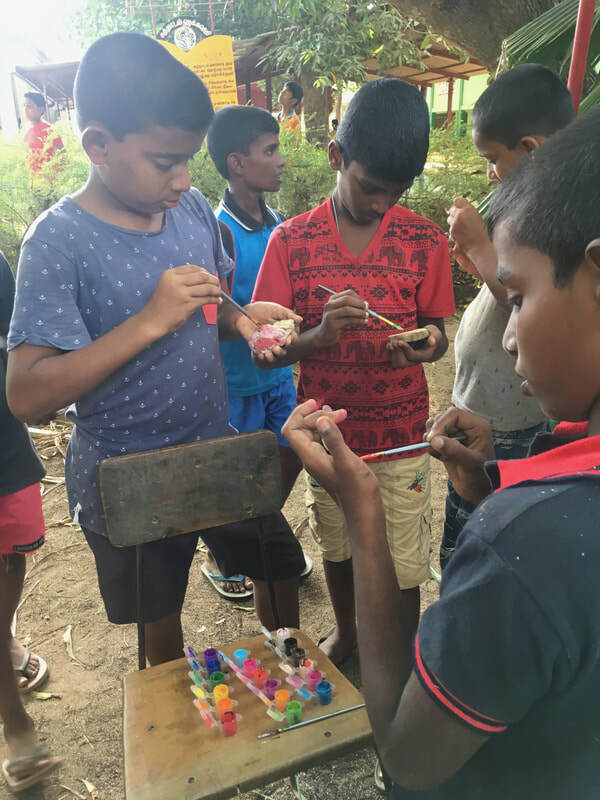 Symbiosis donated much needed art supplies for our recent workshops in Sri Lanka. This is our first collaborative effort with the student group. Farah Faizuddin and Rishabh Lohray started Symbiosis at UT Dallas in May 2017 to bridge art and science at UT Dallas as well as the wider world. 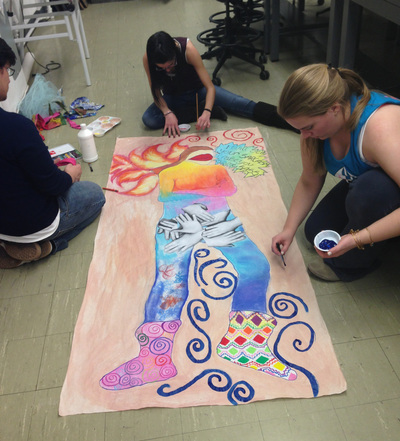 The Symbiosis mission is to explore the interconnectivity between art, academics, and therapeutics. They do this by volunteering with the Texas Scottish Rite Children's Hospital and helping children heal through the power of art. Our other ventures include collaborations with the Dallas Independent School District where they support underdeveloped art programs at Dallas elementary schools by conducting art drives and art auctions. 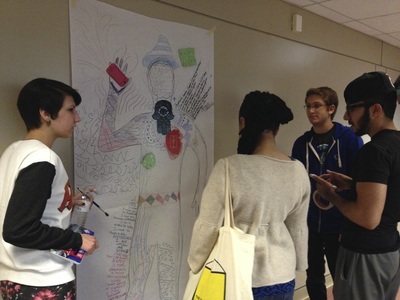 At UT Dallas they have helped to foster an interdisciplinary academic environment by kick starting the Medical Humanities program which aims to teach premedical students the power of the humanities and their potential use in healing. 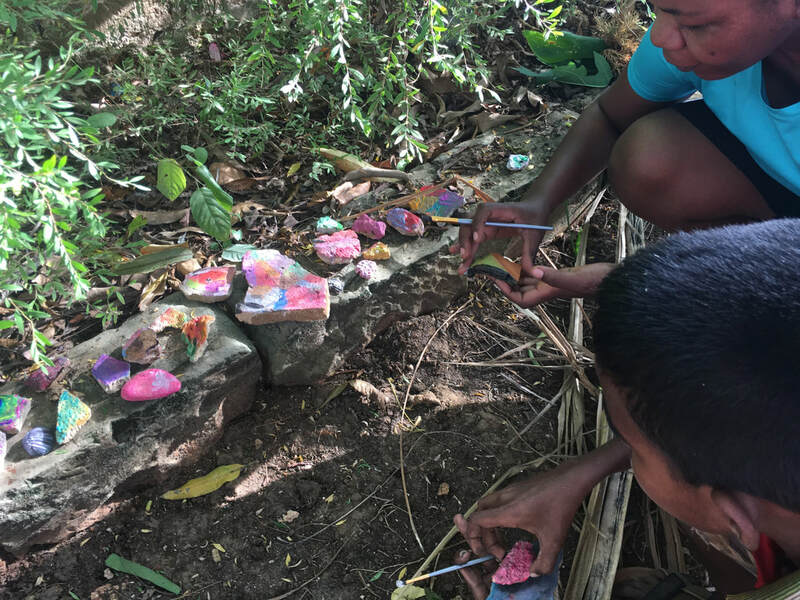 We were joined in Sri Lanka by students from the University of Hertfordshire's Art Therapy MA program. 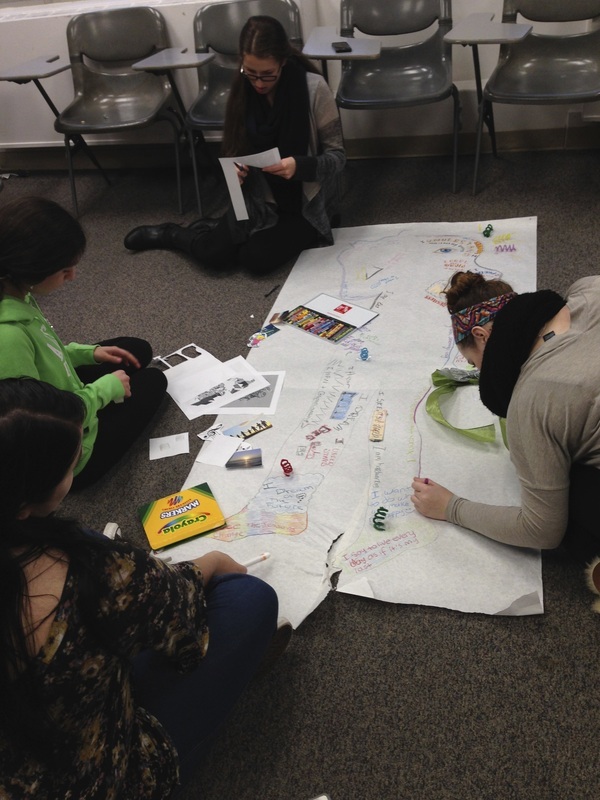 The team used a variety of media to express their intrapersonal experience while listening to music. Taking inspiration from songs requested by members of the public, the work conveys powerful and complex emotions, visualisations and connections that music can elicit. The links between people elicited by the project extended wider still, with proceeds from the sales put towards the psychosocial project in Sri Lanka, giveing people in the conflict-affected country of Sri Lanka the opportunity to experience the therapeutic benefits of art making. Our catalogue documenting our most recent project in Kosovo. Interested in getting a copy? Please let us know. 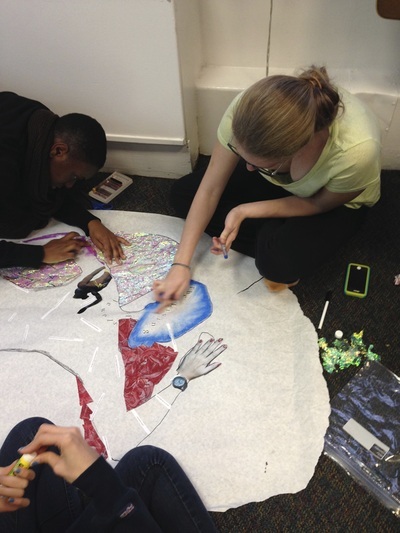 This year ArtsAction Group partnered with Adelphi University to bring 8 students on a study abroad experience through the university's Center for International Education. The experience was led by Professors Cindy Maguire, Hannah Allen, and Ann Holt. Study abroad experiences are notably powerful not just because of the scholarly projects they focus on, but also because of the all-encompassing experiences that the students have meeting people, experiencing new cultures, places, foods, traditions, and values. 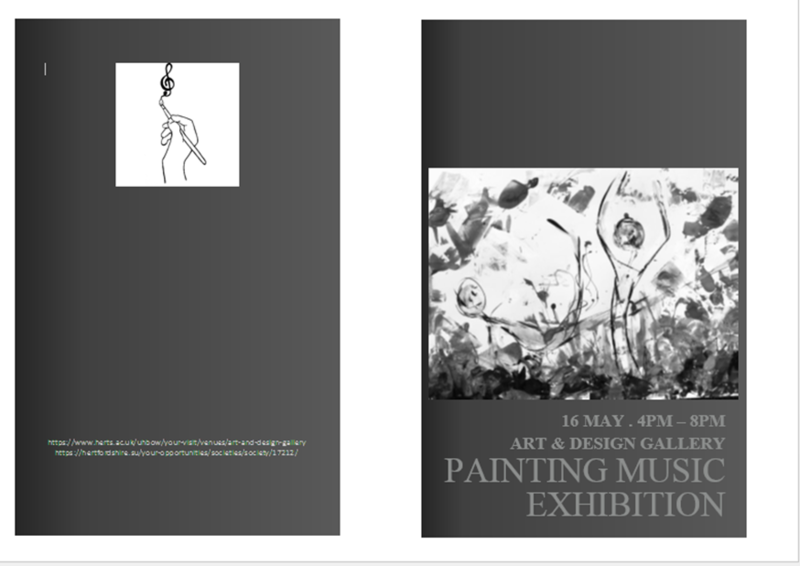 An outcome of the course included an exhibition at Adelphi and an accompanying catalogue. Be sure to also check out our social media sites for the latest news and updates. With the younger students we focused on incorporating the Makey Makey to add interactivity into the artmaking. Refki called upon a former student, now designer, to get the younger children's styrofoam hand-forms cut using laser cutting technology. The hands became the sculptural elements further designed and embellished by the students using mixed media. 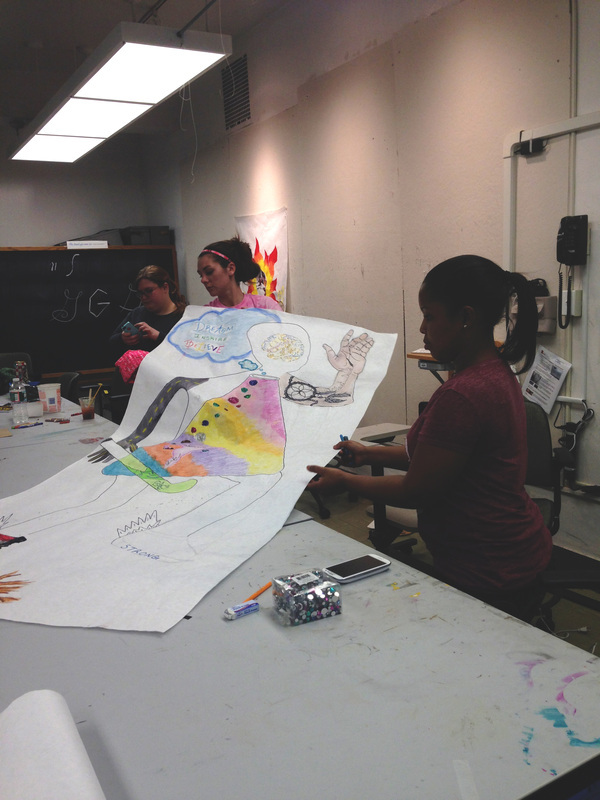 The work with the younger students was held over two days for a total of four hours in the studio. Check out our short video about the work. 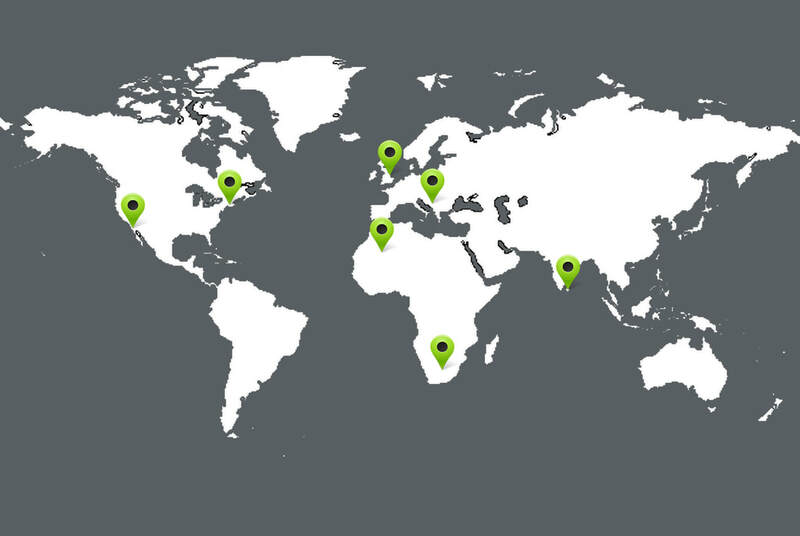 The projects we produce with the Centre have several aims and goals, depending upon student and community needs. 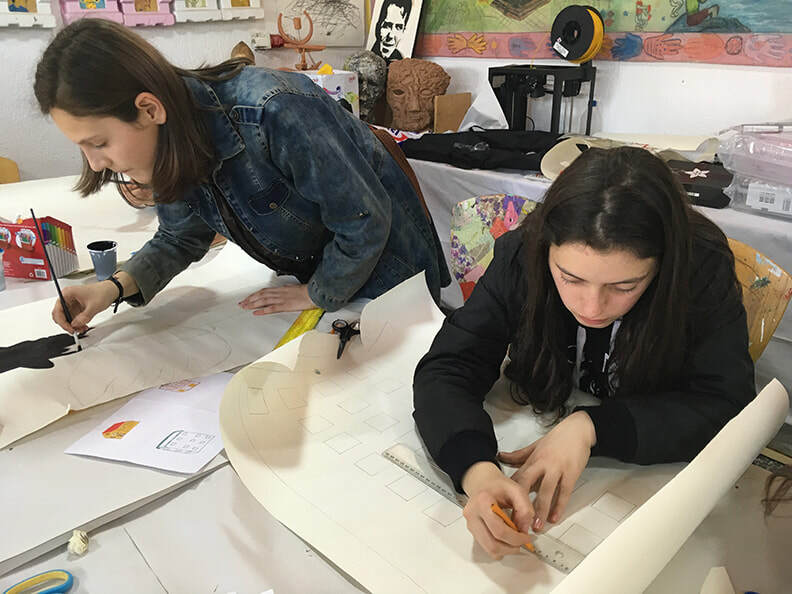 Recently we've been balancing play and skill building by providing students with opportunities to approach familiar media, such as drawing and painting, in new and different ways. With over half of the population estimated to be under the age of 25 years, we want to encourage critical as well as creative thinking in support of their place in a growing global creative economy. You can read the Newsletter by clicking here. To those of you new to the site, most of our activities are posted in real time on our facebook page, ArtsAction Group. 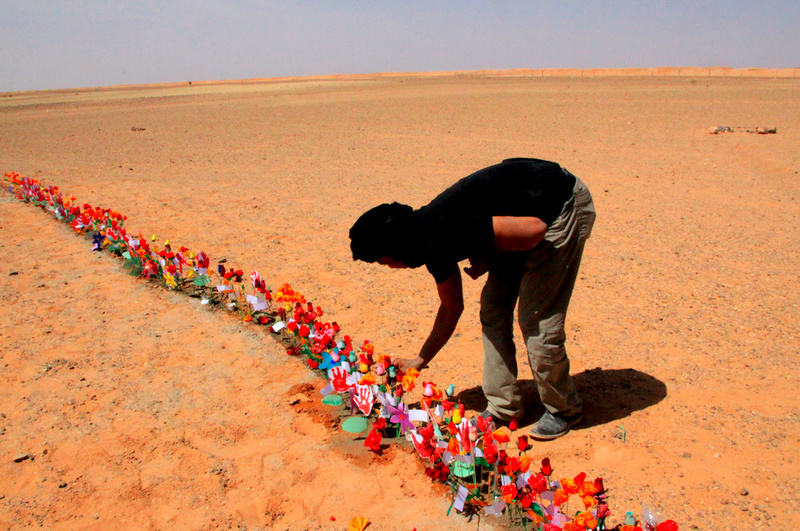 A quick review of the last six months includes a posting of a Shared Roots interview with Fatimatu Mint Budda on our Western Sahrawi projects page and a photographic and video review of our shared work with colleagues and friends at Fellbach-Haus this March. 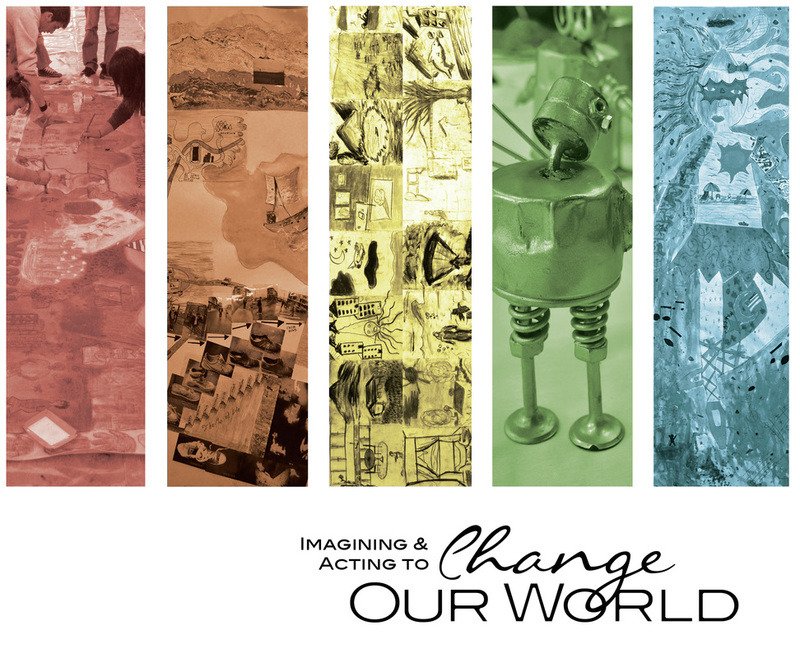 This year's theme: Art and Technology. Both projects are a must see! 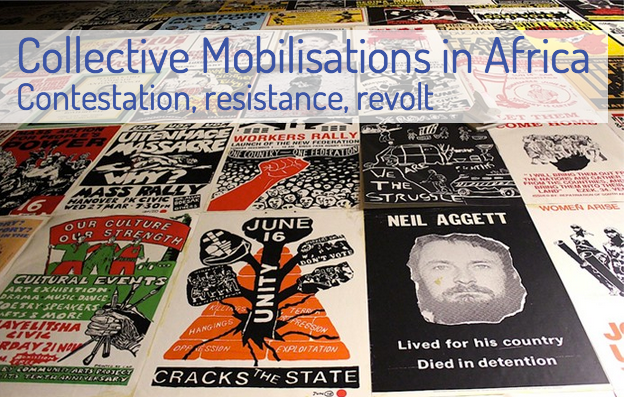 This July Tiffanie Ord and Cindy Maguire, members of ArtsAction Group will present their paper: Arts-Based Activism Towards Liberation: The Case of the Western Sahara at ECAS this summer. 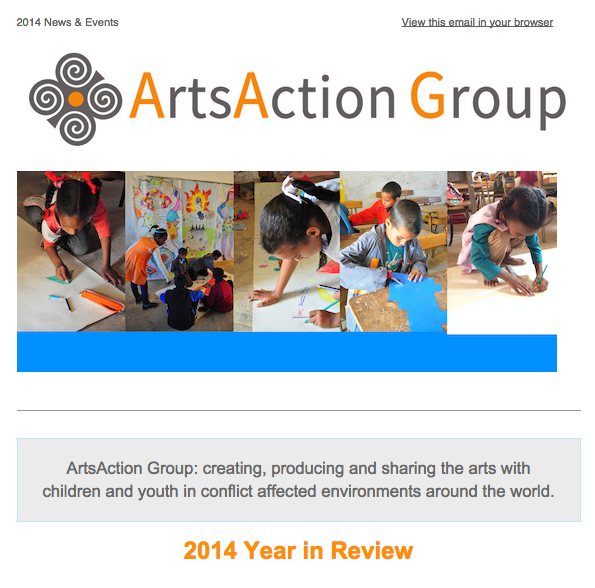 We've produced our end of year 2014 ArtsAction Group newsletter shared with our growing list of partners and supporters. It's been an active, productive and exciting year. Click on the link to view the newsletter on-line. We have only to read the headlines to see how pressing the need is for bringing these kinds of activities to our children and youth. Thanks to all who have supported our efforts in creating, producing and sharing the arts with children and youth in conflict affected environments around the world. Just back from presenting our Kosovo work at the Art, Peace and Conflict Conference at the Desmond Tutu Centre at Hope University in Liverpool, UK. 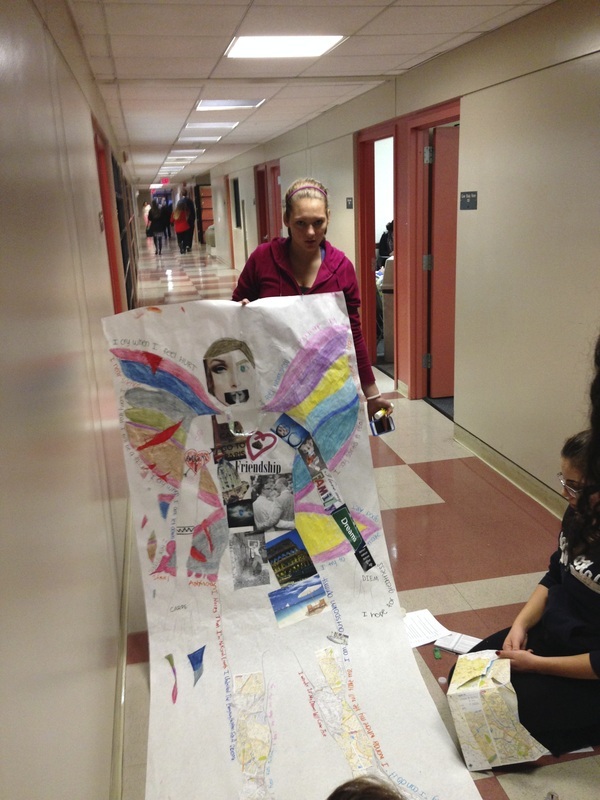 People from around the world presented their work linked to arts, peace and conflict. 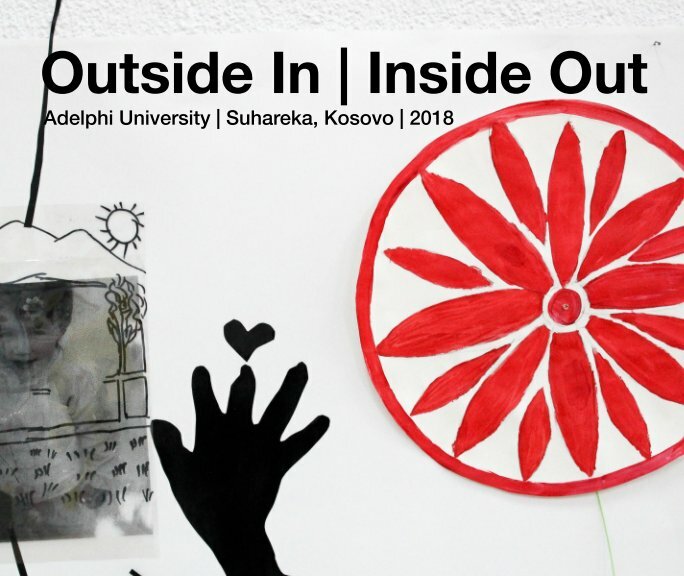 Our presentation, currently a working paper, covers our work in Kosovo spanning 1997 through the present. The work encompasses both community and grassroots-based fieldwork, as well as theoretical framing to illustrate how youth in specific communities, both rural and urban, processed their experiences during and after the protracted conflict and war whilst participating in arts programmes. The visual and performing arts projects were/are enacted across formal and non-formal venues such as refugee camps, community centres, museums, public schools, and cultural centres. 4. State building and community building (2008 and beyond) – transitions from euphoria to ambiguity and fear. The entire event was uplifting, inspiring and a testimony to the power of the arts as a tool for healing and transformation. Stay tuned for more information and links to the individuals and organizations that presented over the 3-day event as well as to our final paper. 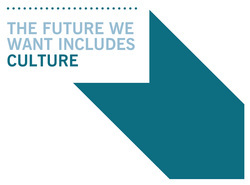 The Future We Want Includes Culture. Please Join Us in this Call! 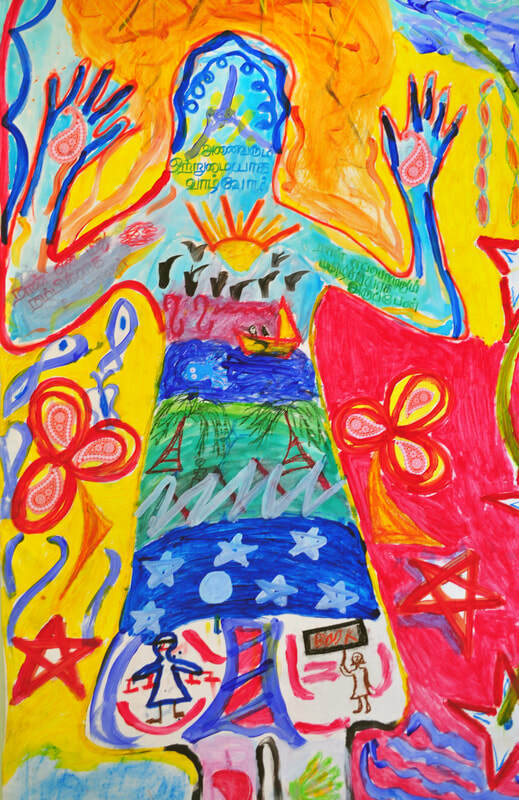 ArtsAction Group joins global campaign calling for culture to be included in the post-2015 Sustainable Development Goals. 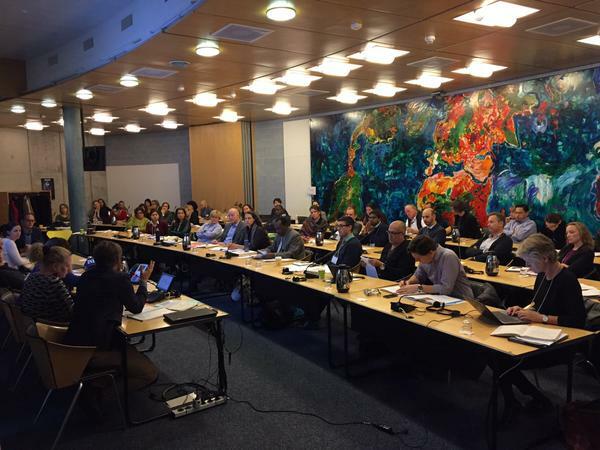 "We believe that culture is both a driver and enabler of sustainable development and that the explicit inclusion of targets and indicators for culture in the Sustainable Development Goals will enable transformative change."